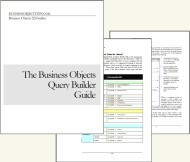 Many of the Business Objects WebI report developers that I have talked to have had trouble at one time or another with the default Java applet for modifying and creating Web Intelligent reports. This Java applet, also known as the Java Report Panel, isn’t necessarily trouble by itself, but having the correct version of Java installed and properly configured on the developer’s PC can be touchy. 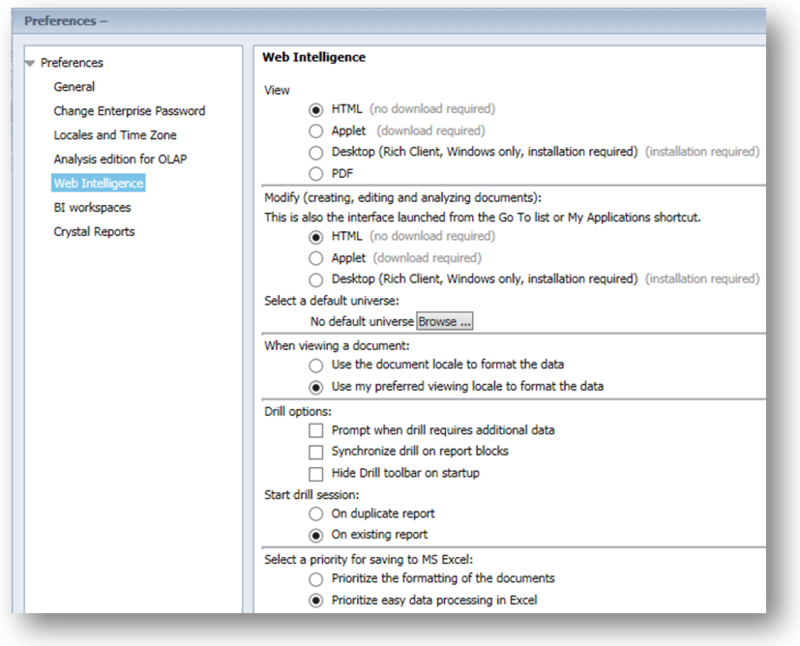 Additionally, many larger installs of Business Objects inadvertently cause the Java Report Panel (WebI Java Applet) NOT to cache on the PC which results in very long load times for each WebI report editing session. 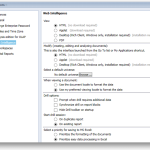 For these reasons I took a close look at the alternate HTML Web Intelligence report editor. The Web Intelligence Rich Client is a possible alternative, but I find it a little clunky and its offer to provide offline WebI editing functionality has lured me into a false sense of security which has resulted in hours of lost work in just this year. I highly recommend that you give the HTML WebI editor a chance. In your InfoView preferences you can chose “HTML” as your editor under the “Modify” heading. I suggest you try it out. It loads much faster than the Java Report Panel and it seems to have nearly all of the functionality. If you don’t believe me, take a look at these comparison images. These images help in the comparison of the various functions of the different editors. There is not a lot of difference here, mostly just in the spacing of the icons on the tabs. The spacing of the icons on the tabs is a little different, but the big difference is that the Java Report Panel has the “New data provider” button and the HTML WebI editor does not. This article will continue in a soon to be published second part. This article is very helpful. Very well documented. If more differences come up (or is more differences go away) our business people will be GLAD to abandon the java applet … as will our desktop maintenance team.